Atlas® Combo 412A 12,000 Lbs. Capacity Commercial Grade 4 Post Alignment Lift - 2 Bridge Jacks RJ-6000 included. 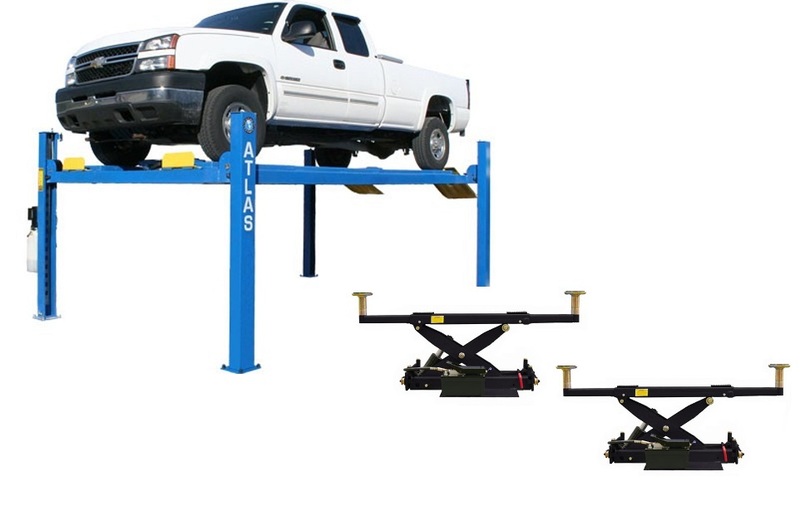 The Atlas® 412A 12,000 pound capacity four post lifts are designed and built to commercial grade standards and will provide many years of service. Our Atlas® alignment lifts offer many exclusive features not found on many other competitor's lifts. Each Atlas® 412A alignment lift includes a set offront turntables. The turntables can be set in different positions on the runway to accommodate a wide variety of wheelbases. There is also a FREEair line kit ($300 value) included when you purchase the “combo package” (2-rolling jacks). The slip plates are built into the runways and are level with the front turntables. There are included metal cover plates (that cover the cut-outs for the turntables) so that the vehicle is not sitting on the turntable if the lift is not being used for alignment. Drive through ramps are available as an option. The Atlas® 412A (12,000 LB. capacity alignment lift) incorporates many structural and cosmetic features that are found on lifts costing thousands of dollars more money. The Atlas® 412A is tested to ensure that this alignment lift system will perform flawlessly at its rated capacities. The Atlas® 412A has been manufactured to the same exacting specifications for many years. The Atlas® 412A uses a high strength cable system (with a under runway oversized hydraulic cylinder) powered by a 220 volt (single phase) power unit to raise and lower the lift. Many competitors use an "old style" chain lifting system with an exposed hydraulic cylinder system. Old style chain lifts are difficult to "level" properly and the exposed hydraulic cylinder is responsible for numerous "door dings". 4-Wheel Alignment Wheelbase Maximum 154 in. 2-Wheel Alignment Wheelbase Maximum 157 in. Thickness of Runway 7 3/4"
Column Dimension 7" x 5"
Base of Column 10 1/8" x 9"
Motor 4 HP, 220V +/- 5% (209-231volts) 1 phase. The Atlas® RJ-6000 (Air/Hydraulic) is a heavy duty rolling jack designed to lift and support 6,000 LB. The commercial grade RJ-6000 (Air/Hydraulic) rolling jack can be used to raise the front or rear portion of a vehicle; allowing the operator of a four post above ground lift to perform wheel and brake service. Most commercial shops buy two of these hydraulic rolling jacks, so that the entire vehicle can be supported in the air at the same time. The Atlas® RJ-6000 (Air/Hydraulic) has telescoping arms that can be extended over the runways of the four post lift. The lift pads at the end of these arms can be positioned under the LIFTING POINTS that are located over the runways of the four post lift. The Atlas® RJ-6000 (Air/Hydraulic) rolling bridge is equipped with expandable supports which adjust to fit many different brands of four post above ground lifts. These supports have a unique roller system that allows the rolling hydraulic jack to glide easily under the entire length of the vehicle. The large heavy steel wheels allow the rolling jack to be positioned under the correct lifting points in a matter of seconds. The Atlas® RJ-6000 (Air/Hydraulic) comes standard with a set of peg style truck adapters which increases the lifting height of the lift pads. These truck adapters will allow the Atlas® RJ-6000 rolling hydraulic jack to raise most pick up and larger trucks that will sit higher than the average passenger car. The Atlas® RJ-6000 (Air/Hydraulic) is equipped with an air/hydraulic pump. The air/hydraulic pump requires a supply of compressed air (air compressor) to work properly. Important: The Atlas® RJ-6000 is designed and engineered to operate on "delivered" air pressure of between70-95 PSI. If you exceed 95 PSI, you may damage your jack. For more information on the recommended operating air pressure of the Atlas® RJ-6000, Click Here. The Atlas® RJ-6000 (Air/Hydraulic) rolling hydraulic jack features two solid locking positions that are used when the vehicle is to be suspended above the runways. When the locking positions of the Atlas® RJ-6000 (Air/Hydraulic) are engaged, the hydraulic pressure from the lifting cylinder of the jack is eliminated. (These locks act much like a pair of jack stands after you lift a vehicle off the ground with a service jack). Distance Between Runway Capability 32"-52"
Second Locking Position 10 1/2"
Minimum Lifting Height 8 1/4"
Maximum Lifting Height (With Both Adapters) 21 3/4"
Click the button below to add the Atlas® Combo 412A /RJ6000 12,000 Lbs. 4 Post Alignment Lift- 2 Bridge Jacks included to your wish list.